Download MovieBox for iOS 9.3: Did you Update iOS 9.3 from iOS 9.2.1/9.1/9? and craving for MovieBox for iOS 9.3 update, which is a great app for Streaming Movies and to watch TV shows. It got much better with the latest iOS 9.3 update and now it is compatible with iOS 9.3 also. Download MovieBox for iOS 9.3 now to continue the experience of watching movies and favorite videos on your iPhone/iPad/iPod Touch. There are several problems after iOS 9.3 update from iOS 9.2.1/9.0.2/9. 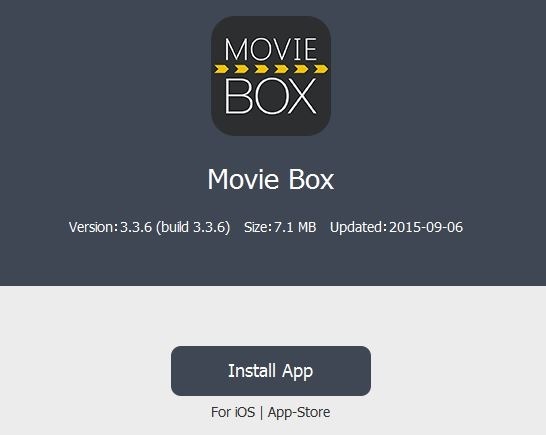 MovieBox can be downloaded without jailbreak as it is not a Cydia Jailbreak tweak. Previously it was available in iTunes, later Apple banned it from the App Store and the developers of MovieBox made it available from the Cydia Sources. With the latest update released, you can download MovieBox for iOS 9.3 on iPad/iPhone without jailbreak. No special introduction is required to say about MovieBox as it got some stunning features which made it so popular among the Movie apps available. Just go ahead and follow the method which I explained here to load MovieBox for iOS 9.3 on iPad/iPhone/iPod Touch devices. If you want to look into the procedure to download MovieBox for iOS 9/9.2, just read this article How to Download MovieBox on iOS 9/9.2. As with the updated version of MovieBox, now it is supporting iOS 9.3 also. Just proceed with the below step by step guide. Visit the address http://www.pgyer.com/moviebox and you will see the updated MovieBox Version 3.3.6. Tap on the Install App button and confirm it to download MovieBox for iOS 9.3. It will show Installing, Press the Home button to view. Wait for a few seconds and you will see MovieBox installed on your iOS 9.3 device. Surprised with the easy procedure to download MovieBox for iOS 9.3 on iPad/iPhone, now start launching the app and enjoy all your favorite Movies and TV Shows on your iPhone 6S Plus, iPhone 6, iPad Air, Mini and iPod Touch. If you encounter any errors while or after the download, do comment us, we are glad to help you.